With the Section Columns feature, RadRichTextBox allows you arrange the text in a Section into columns. 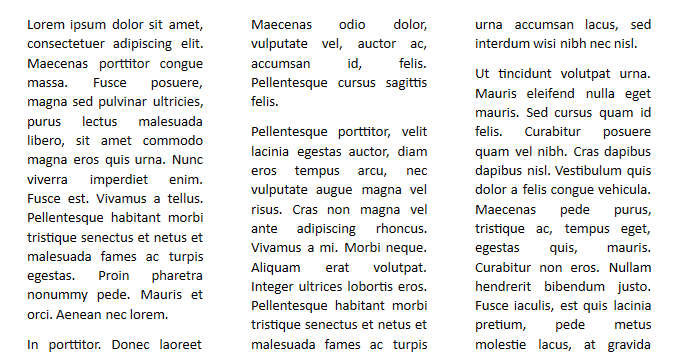 This article will show you how to arrange the text into columns with equal or different width and set a separator between them. Width: Represents the text column width. SpacingAfter: Represents the spacing, which will be rendered before the next column. When columns are rendered, this value is ignored for the last section column. The default and minimal value is 48 dpi (1 dpi = 1/96 inch). SectionColumnCollection(int equalColumnsCount): Initializes a new instance of the SectionColumnCollection class with equally sized columns and default spacing between them. The parameter represents the number of columns with equal width. SectionColumnCollection(int equalColumnsCount, double columnSpacing = 48, bool hasSeparator = false): Initializes a new instance of the SectionColumnCollection class with equally sized columns and default spacing between them. Using the constructor parameters, you can set a different width of the columns and choose whether a separator between the columns should be applied. SectionColumnCollection(IEnumerable<SectionColumn> sectionColumns, bool hasSeparator = false): Initializes a new instance of the SectionColumnCollection class based on the already existing collection, passed as a parameter. Example 1 demonstrates how you can create an instance of the SectionColumnCollection class that represents two text columns with a custom space and a separator between them. Figure 2 demonstrates the result of Example 1. Depending on whether you prefer to insert columns with equal width or assign a specific width for each of them, you will need to create an instance of the SectionColumnCollection class and assign it to the Columns collection of the Section. Another option to achieve a similar outcome is to change the Section layout using RadDocumentEditor. This section will explain the different approaches. To create text columns with equal width, you could directly use the SectionColumnCollection constructor overloads that allow you to specify the number of columns you would like to insert. Example 2 shows how to apply the SectionColumnCollection instance, created in Example 1 to a Section object. The API allows you to create the columns separately from each other with the SectionColumn class. Then, the created columns could be united in a single SectionColumnCollection and applied to a Section. Example 3 creates a collection of 3 columns with different settings and applies it. In addition to the approaches discussed so far, RadDocumentEditor exposes a method that you can use to lay out the text in columns. The overloads of the ChangeSectionColumns() method allow you to pass a SectionColumnCollection instance or a value of the SectionColumnsLayout enumeration. One: Represents a single text column. 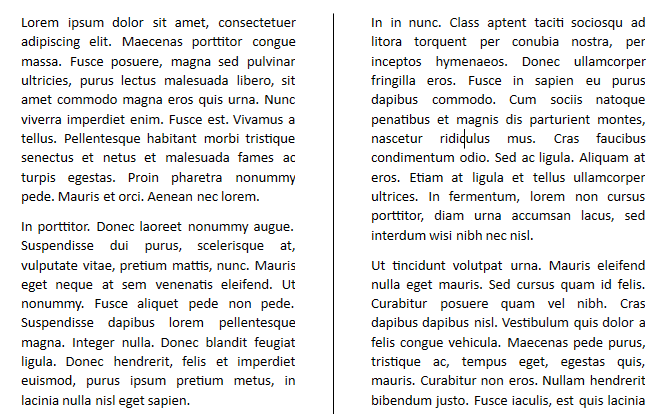 Two: Represents two text columns with equal width. 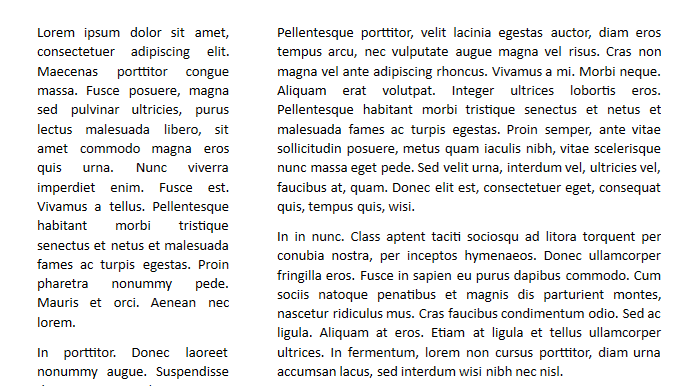 Three: Represents three text columns with equal width. Left: Represents two text columns where the left one has a smaller width than the right one. Right: Represents two text columns where the right one has a smaller width than the left one. You can insert a column break at a specific position inside a section column. For more information, read this article.